Do you see them too, dear? The magnificent 1950s inspired circle skirts pattern range from simple polka dots to beautiful flowers print. With a banded high waist and gathered, voluminous A-line silhouette. 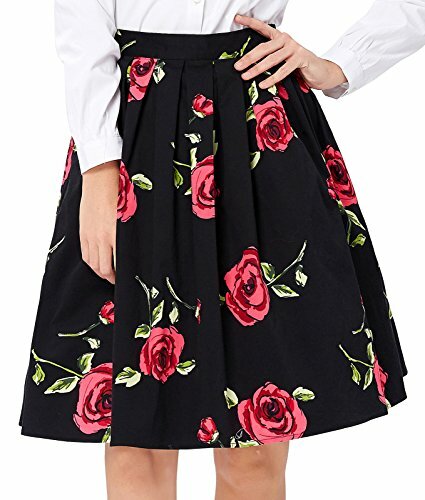 Whether you pair it with your favorite wedges and Pin-up top or a pair of smart flats and a trim, office-ready blazer, this high- waisted skirt will quickly become one of the most worn pieces in your closet. Occasion: Casual, Shopping, Vocation, Party etc. & Please don't soak the dress in water for a long time, otherwise the dye will fade(Of course,dye won't fade under normal washing). The swing skirt is pleated design. Color-5 style and material is a little different from other colors, so before order, please check the product information carefully. Package Contents: 1x Skirt (No accessories included) It's great for daily casual, wear to work and other occasion NOTICE: Before order, please carefully read the Size Chart we provided in the pictures (Not Amazon size chart) Hand Wash by Cold Water Only,Low Iron if Necessary.